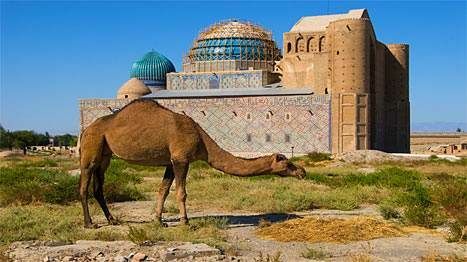 Hands down the country's greatest work of architecture, the astonishingly beautiful Shrine of Kozha Akhmed Yasaui commemorates a 12th-century Sufi master whose teachings and poetry continue to inspire Kazakhs with their message of universal love and tolerance. 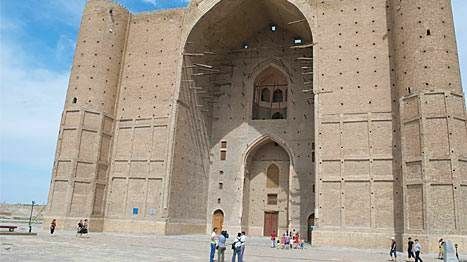 In one of those ironies at which Kazakhstan excels, the shrine complex was constructed in the 14th century on the orders of Timur Lenk (Tamerlane), a brutal warlord of the Genghis Khan variety. Although it was never completed (the old tyrant died during his final attempt to conquer China), this doesn't detract from its breathtaking beauty. Surrounded by rose gardens and fruit orchards, the shrine has once again become an active place of worship, with the rejuvenated Yasaui Brotherhood taking responsibility for running and maintaining the complex. A unique musical order of Sufis, the Yasaui Brotherhood uses song to help focus their efforts to commune with the Divine. They've set Yasaui's teachings and poetry to music, and their religious services - held daily at dusk and dawn - are a stirring blend of singing and chanting. Visitors, both Kazakh and foreign, are welcome to attend. Talking with members of the Brotherhood and visitors to the shrine gives you a real sense of how central the ancient Sufi master's teachings are to Kazakh identity. 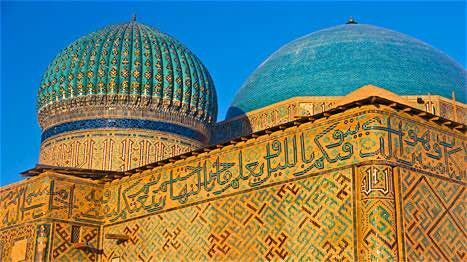 Yasaui was one of the first mystics to write holy texts in the local Turkic language, and to hear his words sung inside the shrine as the sun's glow bathes it a dusky red is one of the most sublime experiences you'll come across in all of Central Asia.